For some, chalking up their hands before a lift represents a sacred ritual — a series of steps, preparation, and mental focus. If you’re stancing up for your next lift and your sweaty hands are slipping around the barbell, it can be anything but. Weight lifting gym chalk can drastically improve your exercise experience exponentially well. Those who have found chalk and added it into their tool belt of items they use at the gym always state one thing, I wish someone told me about chalk sooner. Mark Rippetoe says in his book “Starting Strength” that perspiration on your hands can cause a significance decrease in grip strength and using chalk is the safest way to reduce sweaty hands before lifts. He states using gloves instead of chalk is not recommend since its another surface prone to slipping and should be avoided. He also states that using chalk can help prevent excessive callous formation. Considering the amount exercises and workout routines that require the use of your hands, we wanted to see what other professionals thought about the use of weight lifting chalk. 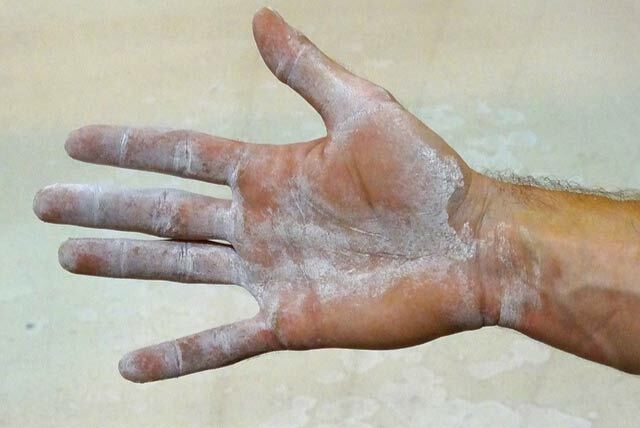 On the search to finding the best weight lifting gym chalk we ran into many questions and issues that athletes had with grip and sweaty hands. Problems like “My grip keeps giving out” “My hands are too slippery” “I can’t hold the bar long enough” “The bar keeps slipping out of my hands” “I can’t lift heavier because my grip is too weak” were seen one too many times. 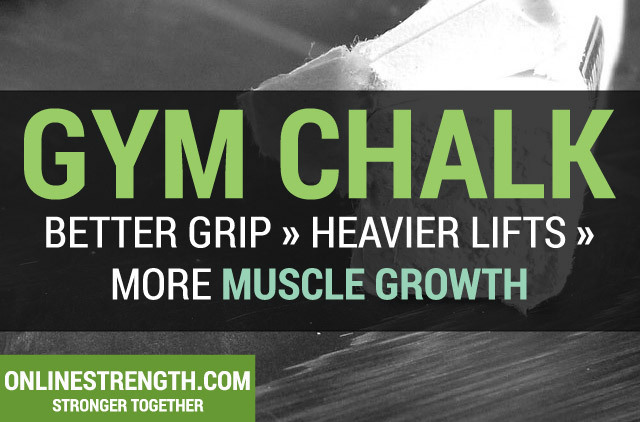 Grip strength was the number one reason people were limiting themselves from being able to give their absolute maximum on every lift. In the long term, little things like this can really hinder overall progression. We found out that without fixing your grip and eliminating sweaty hands during lifts athletes were missing out on potential growth. Whats the price you would pay to help increase your overall strength, weight loss, physique, and looks even if its by 1%? In the end, we saw that many people were unwilling to solve the sweaty hands and grip strength issue. They just end up living with it and continually failing and stopping an exercise because their grip wasn’t good enough. They lose mental focus, energy, and motivation, sometimes giving up and going home for the day. If you’re someone who is okay with lifting with sub-par grip strength and aren’t looking to maximize your time and effort, you don’t need to use chalk. Using chalk made my grip more secure, to me when the bar felt more secure in my hands I felt more confident. I felt stronger and safer when my hands weren’t sliding around. and with that I was able to lift more weight. My overall progression increased and my only regret is I wish someone had told me about chalk sooner. – Elisha Long, Professional Mens Physique Model. Weight lifting chalk is for athletes who are looking to improve every angle of their physical health even if its as simple as applying chalk to your hands before a workout. That being said, there was no one perfect piece of gym chalk, and no single chalk fits everyone. If you’re looking for the best weight lifting gym chalk that will support your grip and help ease those sweaty hands, GSC Gym Chalk is the way to go. Comes in a 1 pound box with 8 individually warped 2 oz blocks of chalk (this will last you several years). It gets our top pick because the strong brand and fantastic reviews. However, if you’re someone who doesn’t prefer blocked chalk, Yeti Strong Ultra-Premium Gym Chalk comes with the chalk already broken down into a nice powder. With over 47 hours of research on weight lifting chalk, we focused on the properties and composition of the chalk and which qualities were best for athletes. We surveyed the masses, consulted with professional strong men with years of experience chalking up their hands, and even field tested the results of using chalk and not using chalk while lifting. The process we went though seemed almost trivial, after all it is just chalk and choosing one was just a process of buying a block off of amazon. However, we wanted to help find the best possible gym chalk that you could buy, we wanted to look under every nook and cranny to make sure we weren’t missing something about using gym chalk. So we went through dozens of top weight lifting, power lifting, strength training, climbing, and crossfit websites, forums, and blogs to see all the top websites were saying about gym chalk. We took our top choices of gym chalks and went to several gyms and tested them ourselves. Not only did we put them to the test but we also asked the local gym goers who were already in the gym to try using chalk before their next exercise. One thing we found out straight away was not not a lot of gyms are very ‘chalk friendly’ and refuse to let the athletes at the gym to use chalk. Aside from that, the people at the gym that never used chalk before were actually surprised at their results and felt much better lifting with the chalk on their hands than without it. There were a number of different chalks we tired, all of which were made from magnesium carbonate. We tested the ones that come in blocks, we tested the ones that were already in powdered form, and we tested the ones that came in a ball/sock like ball. From our tests we concluded that a majority of the chalk was all the same and there was little difference in how they worked or benefited sweaty palms. Basically any magnesium carbonate chalk will work at eliminating sweaty hands and increase strength grip. Before making this conclusion that all lifting chalk got the job done we wanted to do our research and ask the professional opinion of users who have been using chalk for many years. There were a number a small unique features across the board that made some gym chalks better than others, and these factors are useful to take into consideration before you make a purchase. In total, we spent over 47 hours analyzing weightlifting websites, crossfit forums,fitness youtubers, climbing blogs (since they use chalk more often) and researching the brands of chalk that were bought more often by big professional gyms to get an idea of what chalk people bought most often. Being at the gym always gave me anxiety and my hands would sweat like a water fountain. Then when it came to lift and do my set of my grip was always sloppy. Using chalk helped keep me focused on my lifts and not just waiting for my grip to slip – and my grip slipped constantly. – Jamie Fitch, Avid Gym Goer. We also wanted to look at what chalk big name fitness atheltes were using like, Steve cook, Elliott Hulse, youtube fitness celebrities like Chrisitan Guzman, and the hodgetwins were using. We wanted to make sure were going to recommend the absolute best. With the initial 20 or so chalk products on the market that were taken into consideration, we narrowed down our top 5 picks by looking at the reviews on amazon, the choices the people recommend on forums, and the chalks that fitness models were using. We also looked at other fitness websites (Bodybuilding, MusleandFitness, LiveStrong) to see which chalk products they recommend. We then took that list of the first 20 and just narrowed them down to the top 5 based on how often they were recommend. So after we narrowed the list to the top 5, this is when we went ahead and purchased the chalk and headed out to the our local gyms. Yeti Strong Ultra-Premium Gym Chalk comes in a bag that is not in a pressed block form. Through our research we found out that some people prefer a free form chalk powder over a block. Its a well made chalk by a strong brand that has a good reputation for happy customers. So if you are someone who wants to have their chalk already broken down AND in a nice little baggy that you can take to the gym, this is the chalk for you. We noticed that taking chalk into some gyms was sometimes messy and almost embarrassing (in some gyms). If you’re worried about making a mess or just want a convenient way to carry your chalk, there is gym chalk that comes in a sock-like ball. You can just press the ball in your hands and the chalk will come out. This helps keep the spreading of chalk to a minimum. Liquid chalk is unique chalk that comes out of a squeeze bottle in liquid form. Sort of like glue. It works virtually on all hands even the most sweaty. There is no mess and it works fairly well. This is perfect for those who don’t want to carry around a container of chalk or are not allowed to use chalk at gyms because of the mess it makes. Liquid chalk makes zero mess and is a good alternative to powdered block chalk. My hands are always uncontrollably sweaty. I was never able to hold heavier weight because i could never firmly grip the bar. My friend let me use some of his chalk and now I always chalk up before my heavy lifts. My lifts have gone up, and I can do a few more pull-ups. I bought a bucket of chalk for my own gym and use it daily. – Nick, Fitness Lover. If you want an easy, effective, and cheap way to increase your potential to do better in the gym, you seriously need to just buy some gym chalk. The bar will feel better in your hands, you’ll be able to do more pulls up with a firmer grip, and you’ll be able to focus on lifting and not so much on your grip slipping. Basically a majority of all exercises require you to have a firm grip, chalk will significantly improve this. In the long run, if you start using chalk you’ll be able build up more grip strength. Your grip strength will go up, the amount of weight you’ll be able to lift will go up, the amount of reps you can do will go up. Its not difficult to choose the right weight lifting chalk, from our research they’re all about the same and will help you greatly. We recommend you go with GSC Gym Chalk or Yeti Strong Ultra-Premium Gym Chalk. These chalks are the ones used and bought most often, and they’re also the most affordable. The supply will easily last you a year or more. There you have it. If you want a way to improve your lifts, and maximize your efforts (even if its marginally) you should definitely buy a few blocks of weight lifting chalk. Simple, effective, and you can have right away.